Last year, Mormon radio host Glenn Beck swept the conservative political movement off its feet (and many Evangelical Christians as well) with his Divine Destiny rally. At that time (and since) many non-discerning Christians have embraced Glenn Beck as a brother in Christ and have even made excuses and justifications for his Mormon theology (a theology that’s antithetical to biblical Christianity). But now, while Beck’s Trojan Horse sits benevolently within the walls of Evangelicalism, the trapdoor on the underbelly of the wooden horse is opening to reveal its contents . . . and it isn’t pretty. Brannon Howse has written an article on Beck’s new book (co-authored by Keith Ablow). 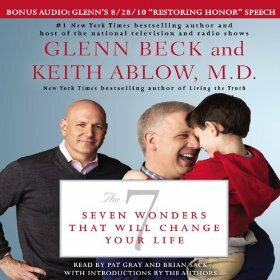 The book, entitled The 7 Wonders That Will Change Your Life, has revealed Beck’s New Age leanings. And judging by the quotes cited from Beck’s book, it makes Joel Osteen’s Your Best Life Now look like a doctrinally sound tome of deep Christian theology. I can’t help but wonder if the Mormon organization is going to publicly renounce the New Age teachings in Beck’s book (and discipline Beck), and I wonder if the Christians who supported Beck–claiming that he was indeed a Christian–are going to retract their support (or at least distance themselves). This entry was posted in Apostasy/Lukewarm, Mormonism, New Age Nonsense and tagged Apologetics, Apostasy, Bible, Blogging, Book, Book of Mormon, Books, Brigham Young, Bruce McConkie, Carthage Jail, Christianity, church, cult, Cults, Divine Destiny, Evangelism, false prophet, false prophets, False Teacher, False Teachers, Glenn Beck, God, Gospel, heresy, Hyrum Smith, Jesus, Joseph Smith, Joseph Smith Jr., Latter-day Saints, LDS, Mormon, Mormon Doctrine, Mormonism, New Age, News, Politics, Quick Questions, Religion, Salt Lake City, Sarah Palin, Theology. Bookmark the permalink. Very scary but not surprising. Well done job on the cover..the bald fellow is a facsimile of the well known, very successful Stephen Covey and the 7 Wonders that Will change your Life mimics the multi-million seller The 7 Habits of Highly Effective People. When I saw the cover the first thing I thought of was the 7 Habits book, it mimics and lends credibility to the average consumer. I suggest that is not an accident. Anyone who cozies up to a Mormon and calls him “brother” has cause to doubt his own standing with God. Richard Land has done the true church no favor by calling Mormonism “the fourth Abrahamic faith”. Once one leaves orthodoxy, anything goes. New Age Mormonism – what a weird idea! Once one exchanges the (objective) truth of God (the Bible) for subjective “truth”, one begins the downward swirl. And once one allies themselves with a “good cause” (such as fighting those “cursed Liberal Democrats”), “truth” can easily become whatever supports their chosen goal. I would not at all be surprised to see “christians” continue to support Beck for their perception of a “greater good” despite his outright denial of Biblical truth. And why not, how many “christians” continue to support the likes of Warren? How some Christians can see him as a Christian when he profess to be a Mormon is a mystery. The quotes above puts alot of things in perspective. How can he think people are inherently good? Sad, and lack of Biblical knowledge. I pray God will save him. Sadly, too many Christians believe Mormons are just another Christian denomination. And that is mostly due to two things: 1. The great LDS propaganda machine with its lies, and 2. It is a rare pulpit from which you will hear teachings against cults which expose them! Why would they denounce him? Evil doesn’t have 37,000 denominations, like “good.” A house divided against itself cannot stand, right!?! Yet “churchianity” embraces the deceptions of “every wind of doctrine” today…just as Jesus said…itchy ears and all. Thank you Jesus for the One Church You are building, that the gates of hell cannot prevail against. The Great Whore? Who is she?” The Roman Catholic “church?”…Then who are her “daughters? Think about it…come out from her, and serve Jesus Christ as Lord! Does your “learned discerner” tell, you I am Mormon?!?! Then you have no discrernment at all, and thus contend for the faith from your flesh man. Which is what most men who look for affirmation from state sponsored theological seminaries do. This is the satanic garbage that God saved me from and delivered me from. And to see it so widely being accepted by, not just society, but the church is horrific. Glenn Beck is an anti-Christ plain and simple. I caution anyone who will listen…flee from this man and his pseudo-Christian humanistic paganry! Mormonism is paganism, just as is New Ageism. Both think you can be your own god, determine your destiny and that man is basically good, and that if one works hard enough, he can move on to a higher plain of spirituality—even commanding one’s own world one day. There’s no leap, no surprise here. The problem is that “Christians” of today are VERY deceived, have a VERY low view of Scripture and of God, and therefore have a Post-Modern mentality of “truth in everything”. Truth in Rome, truth in Mormonism, truth in Eastern mysticism, truth in psychology, truth in evolution…..you name it, they find “truth” there. Sadly they are also the ones that don’t see biblical truth as solely Truth—they even pick and choose what they see as true, from Scripture. When people accept Roman Catholicism and Oneness Pentecostals as Christians, you know its over. The true circle of biblical Christians is so much smaller than we ever thought–God is revealing just how small. May He strengthen those that are His, and protect His churches from such damnable error that leads to death. Question? When a person has a lamp, but not the oil, who are they? Answer a foolish virgin. Thy Word is the Lamp unto my feet and the Light unto my path. The Holy Spirit is throughout the bible represented by oil, among other symbols. Why is this important? The broad road to destruction is full of people who have a bible, but no understanding of the Word in a spiritual sense because they have not the Holy Spirit! They have a form of godleyness that actually denies the power of God. They then are no different then Pharisees who had the Word but held their traditions as higher. They entered not and prevented those who followed them from entering. Jesus, when commenting in Matthew said “They sit in Moses seat, (as in they had authority) so do whatever they say (when it lines up with Moses Law, not the traditions of men added by men, and held above the written Word.) “But do not as they do…” The Greek missed in the translation from the original Hebrew, not Aramaic in this. Blind Guides actually can be translated blind seats. A lot of folks have a legal understanding of the Word, and stand on the complete cannon of scripture, as that which is perfect has come. This is a mis-understanding in that while the complete cannon of scripture is set-LOGOS. The purpose of the Holy Spirit is to reveal Jesus’ Truth to us in the Spirit. When folks add RHEMA to the LOGOS they are doing the exact same thing the Scribes and Pharisees did. We are to test the Spirits, How? By the Word of God in context, as Revealed by the Holy Spirit who gives us all Truth in Christ Jesus. Unfortunately many divisions claim The Holy Spirit’s Work ended with the complete cannon of scripture being written down. Thus they have neutered the Holy Spirit/ grieved the Spirit by saying His Work is now limited. Yes it fits them too! You must be born from above, and follow Him as Lord, repenting, and not depending upon a receipe laid out for you by the Traditions of men! I reject and repent of all the Jesus franchises today, whether steeped in signs and wonders dog and pony shows, or legalistic quoters of dead men. I am in the one body/church/bride that Jesus is building/preparing and the gates of hell cannot prevail against! I am in Him, He is in me, and all of it was by His Grace! He alone called me, keeps me, and teaches me through the Holy Spirit! It is all, of Him, from Him, for Him, through Him, and to Him!!! I have not been listening to Glenn Beck or anyone else the mainstream official Religious- Government Industrial Complex System promote in the media. But reading those quotes; they are all Masonic (satanic) doctrine. This is all for the Masonic (satanic) Brotherhood one world religion. The enemy infiltrates the Church or so called Christianity and the majority follow thinking everything is wonderful. The birds of the air have “lodged” (Masonic Lodge) in the branches thereof. The whole lump is fully leavened. The leaven is a bad thing it is evil. The end game, aside from the spiritual angle of the one world religion is the political goal of Dominionism. The new world order, political though it is, is about religion. It is about worship. You know, Nebuchadnezzar’s statue and the command to bow. The trick is, we see many groups working for Dominionism (can you name them?) but how many Evangelicals see the trick of the Evangelical Right Wing…. and its true identity as Dominionism as well. This thing is Diapraxing to consensus. Evangelicals are caught up in the Dialectic. But many Evangelicals will continue to seek a flesh solution to the world’s problems, desiring to “take America back for God”…and force the “Kingdom Now”.. when this all just plays into satans Masonic antichrist Dominionist agenda, that serves him. May the true believers and followers of the Lord Jesus make their allegiance HIM and not the flesh, not this world, not earthly powers, not men, not physical Nation-States, not Dominionist ideologies for a kinder and gentler country for our children to grow up in. May we be singularly devoted to the Lord Jesus Christ and the truth of His gospel. May He leads us into all Truth and separate us from the lies. May our allegiance be only to Him. May we not bow to Babylon’s one world religion, no matter the cost. I won’t read the book…as I had an uneasy feeling about it from the moment I heard of it. However, I do believe Glenn Beck is on the right track….attempting to let us keep our religious freedoms and *not* turn into a socialistic nation (moreso than we already are). I read the Bible, daily and have a strong faith in Jesus. I *don’t* worship glenn beck and know he has many short comings. I don’t agree with his book or his Mormonism…however, I *do* believe he is on the right track as far as our country is concerned. He really seems to have a good heart and desires the best for people….he’s just misled, like so many people are. I also want to add, that I believe a lot of the “personal truth” beck talks about, to me, stands for personal responsibility. Working hard and not letting the “state” pay your way and keep you afloat. It does sound bad, in a way, but without the whole context of the book, it’s hard to understand. Socialism stands on the premise of the hard workers paying for those who won’t pay for themselves. There are so many living off the State (aka: our tax dollars) instead of working or the church coming together to help them, that people end up being controlled, then, by the State. I am *not* New-Agey and certainly know that the only good in any of us comes from Christ, alone. I just wanted to stick up for someone who has tried to keep liberty alive in our country…as no one else seems to be doing it.
. Most of the time an abortion done in the seocnd trimester is done while the patient is under twilight sleep or general anestesia. You would not remember anything.I have had three abortions in my life, the lives that I stole will always haunt me. I had 2 abortions that were done within 12 weeks of conception and one done at 20 weeks. As I was leaving the abortion clinic after the procedure, I saw a nurse inspecting an aborted fetus (could have been mine). It was an obvious baby. It was red and in several pieces. This happened when I was 18, I am now 38 and it still haunts me and I imagine it always will.I know what it is like to take a life, to give life and keep it and give life and give it away (adoption). Let me tell you that giving life is less painful than living with the acts of abortion for the rest of your life. It is a painful hole that can never be filled and the more you try to fill it, the deeper and darker it becomes.My oldest daughter was supposed to be aborted. She would have been the 4th. I had the laminara stips put in the night before the abortion. I was 23 weeks pregnant. I changed my mind, I went to another doctor, had them removed. I had a healthy baby girl a few months later. She will be turning 18 on August 29th. Today she and I are the best of friends, I cannot imagine my life without her. I have told her everything about her life inside my belly. She has learned through me that she never wants the same things to happen to her and she forgives her mother for almost ending her life.You need to know what you are going to loose with an abortion esp. this far advanced.